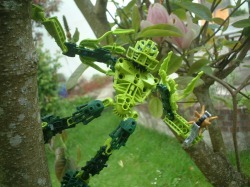 Matar is always on the look out for Makuta Forces and is the fastest of all Toa! his top speed swinging around in Caniscow village is 314 MPH. If there was a cave and the Toa were going to go in it, Matar would just bardge in without thinking whats in there. Matar is very impatiant wants to do stuff quickly but Caswhere tells him to take him time with stuff but Matar will never stop.